Since the appearance of Banach algebra theory, the interaction between the theories ofBanach algebras with involution and that of bounded linear operators on a Hilbert space hasbeen extensively developed. The connections of Banach algebras with the theory ofbounded linear operators on a Hilbert space have also evolved, and Calkin Algebras andAlgebras of Operators on Banach Spaces provides an introduction to this set of ideas.The book begins with a treatment of the classical Riesz-Schauder theory which takesadvantage of the most recent developments-some of this material appears here for the firsttime. Although the reader should be familiar with the basics of functional analysis, anintroductory chapter on Banach algebras has been included. Other topics dealt with includeFredholm operators, semi-Fredholm operators, Riesz operators. 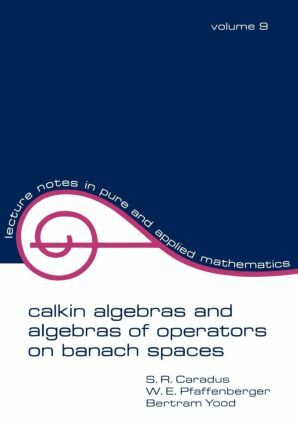 and Calkin algebras.This volume will be of direct interest to both graduate students and research mathematicians.